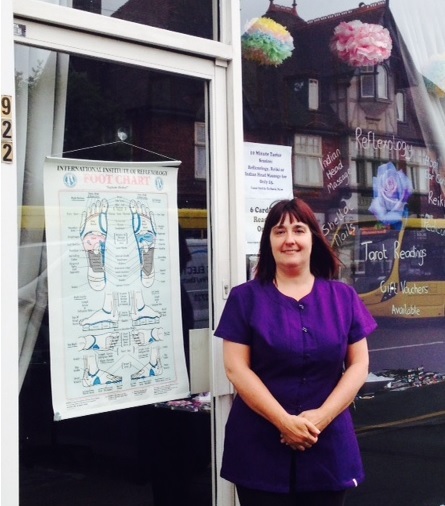 I hope you find my website informative and interesting enough to entice you to book a treatment or pay me a visit in my friendly salon, Crystal Rose Therapies, which is situated just a few shops away from Pokesdown Railway station, near Bournemouth. My name is Tracy Rose and I have been a qualified therapist since 2001. I was a single parent living on benefits just drifting through life when I opened an Adult Education booklet and found that I could learn Reflexology whilst my daughter was at school. This was a turning point for me, and I went on to learn Indian Head Massage and Reiki, and over the years have added other therapies and techniques to enable me to provide relaxation and healing to my clients. I offer holistic treatments; these treat the whole person and not just the particular symptom or ailment which is presented by the client. A holistic treatment encompasses the emotional and mental state of a person as well as their physical state. Many illnesses begin at an emotional level and then manifest themselves as a physical problem. Stress is the most obvious example of this - we get stressed mentally and emotionally and if left untreated this will manifest as a physical condition such as headaches, IBS and in severe cases can even cause a complete breakdown. Treated holistically, the body is able to heal itself on all levels, thus maintaining a healthy balance between mind, body and soul. Indulge yourself in treatments such as Reflexology, Reiki, Indian Head Massage, Facials, Hopi Ear Candles, Pedicures and Shellac Nails. Or, if you need some advice and guidance, I also offer Tarot readings. I offer all treatments at a competitive price, please like me on facebook to check out my special offers which usually run every month. There is also a selection of handmade crafts available for sale in my salon, as well as photographs of local scenes, please feel free to come and have a look.